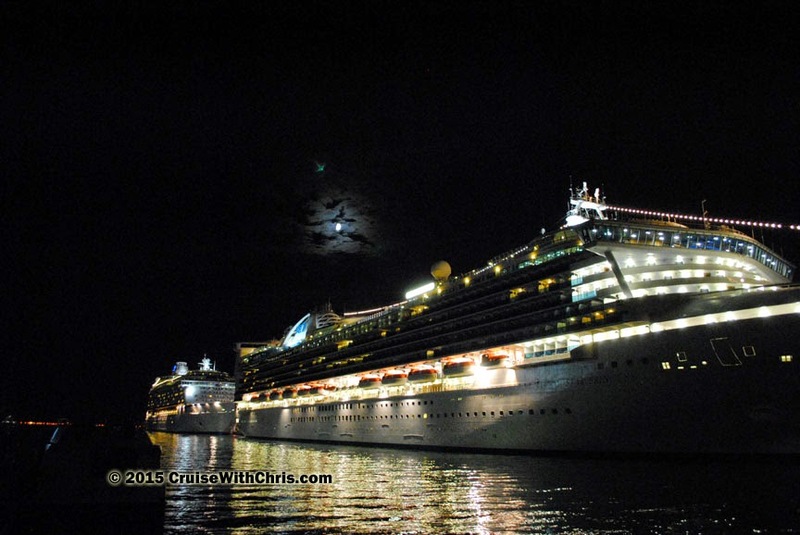 Our ship overnighted in Venice, Italy which gave us the opportunity to explore the city of canals at night. Taking a water taxi from the ship, we made our way to St. Mark's Square where we began our self-guided walking tour. Here are just a few of the sights we saw that night. Click on images to enlarge them. The Piazza San Marco may be more famous, but the Ponte di Rialto (Rialto Bridge) is the true heart of Venice. 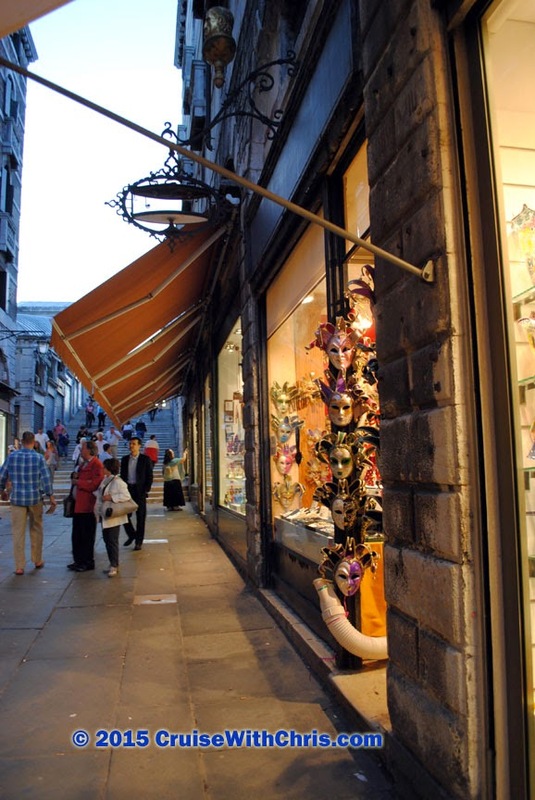 As we approached the Rialto Bridge, there were many people checking out the local shops. It was just starting to get dark. If you plan to walk through Venice, be sure you have good walking shoes and are able to climb stairs. This is especially challenging if you have luggage and are heading to the train station (which was our main objective for the evening). We wanted to figure out where we'd be going in the morning to catch the train back to Rome. With its gondolas, canals, amazing restaurants, and unforgettable romantic ambiance, Venice is definitely a city for one's bucket list. Our first glimpse of this amazing city was from the ship's deck as we sailed past the canals to our dock. Next we saw the city from a water taxi and then explored during the day by foot and finally gondola before returning to our ship for dinner. The most amazing view was walking through the narrow streets and over canals at night. The lights cast a glow that really changed the mood of the city. 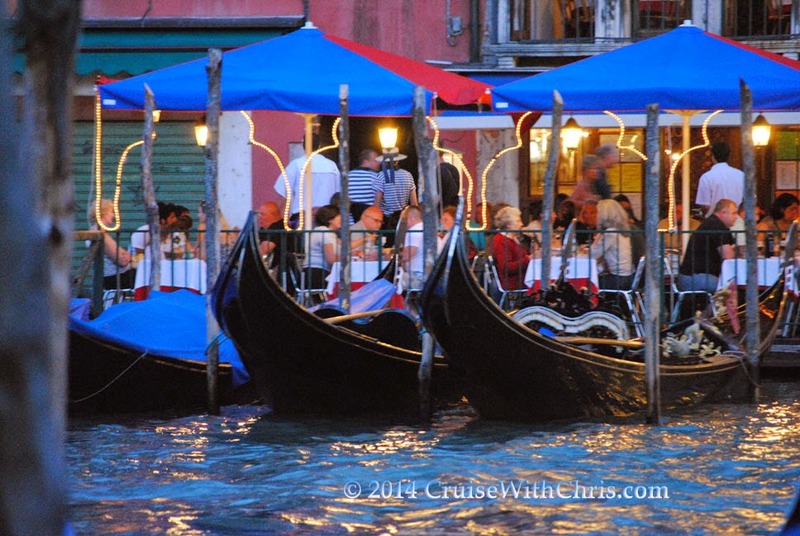 Along the Grand Canal, the restaurants were filled with visitors and local patrons enjoying an evening meal with a view. The moon was almost full and shone brightly on the city below. 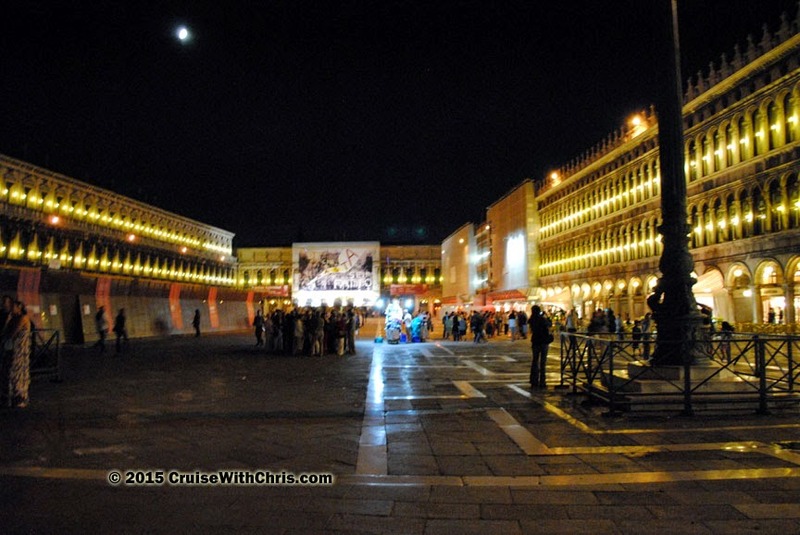 What a beautiful sight as we concluded our nighttime exploration of Venice via water taxi back to our ship. 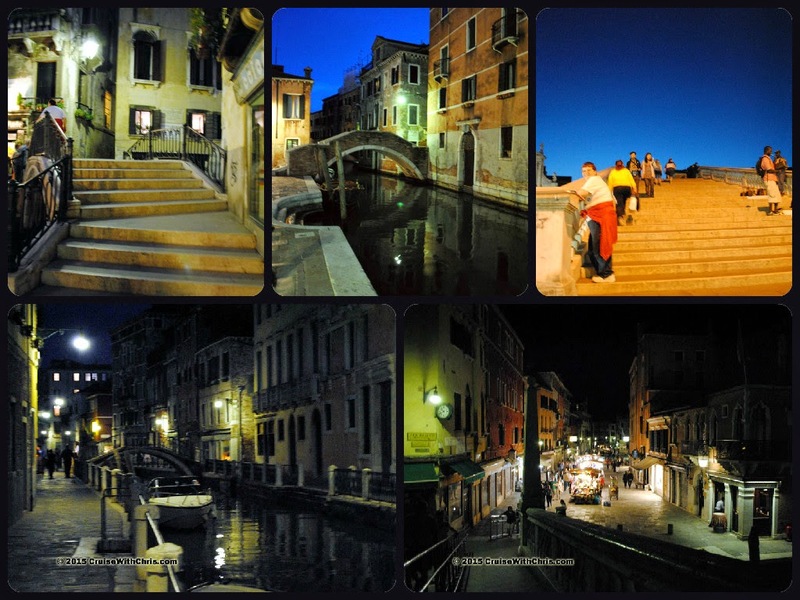 We hope that you enjoyed this brief visit to Venice at night. 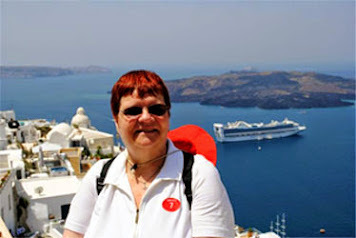 Check out our Diary of our 12-Night Mediterranean & Greek Isles Cruise for more stories about Venice and our other ports as well as links to our photo albums. This week #FriFotos theme is #NIGHT. It is being repeated by popular demand. 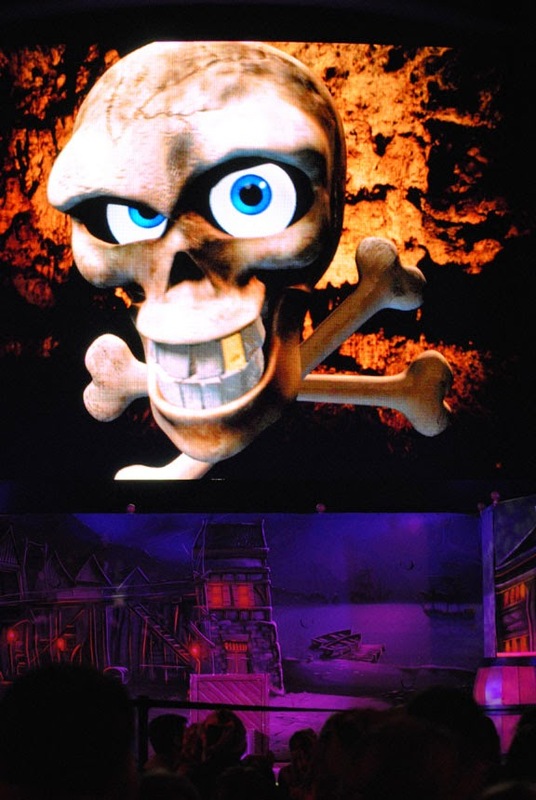 When thinking about images that could represent the theme, the first thing that came to mind was our unforgettable night aboard Disney Dream for our National Conference a couple years ago when we were entertained by the Disney Cast and their Pirates in the Caribbean deck party. The highlight of the event is when Disney lights up the sky with fireworks which can be seen from your balcony or on the open decks. Due to technical difficulties caused by weather, it was actually postponed a day during our cruise, which made the anticipation even greater. All the guests gather on the open deck for a high-energy show as the highlight of Pirate in the Caribbean night. If you want a different perspective of the show, why not include a ride on the AquaDuck which is awesome at night. So, don you pirate costumes and join the Disney Cast on deck for an unforgettable night of entertainment. Disney was the first cruise line to bring fireworks on board their cruises; others have now followed suite. This is a true story of two of my guests that were booked on Quantum of the Seas departing New York on Saturday March 20th. We join the story on Friday morning. 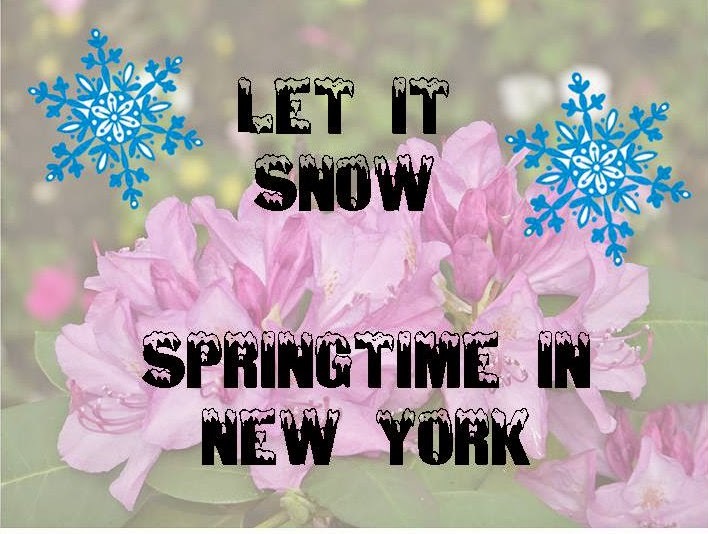 As the day before departure approached, so did a spring snow storm in New York City. Hundreds of flights were cancelled in advance of the storm - including theirs. This story has a happy ending. Springtime in Chicago and New York can be unpredictable and getting to the ship on time could be problematic. Normally they would have flown to the departure port a day early, but this time they were unable to get out of work for the extra day, so they opted for an early departure on Saturday, the day of the cruise. The flights were arranged by me on their behalf through Royal Caribbean ChoiceAir program. ChoiceAir benefits include assured arrival to the ship in case of airline complications, total flexibility to pick your preferred airlines and itineraries, and most importantly in this case, 24/7 support. My day Friday began with a frantic email informing me that their flight had been cancelled. I placed a call to ChoiceAir and was fortunate to get a hold of Evarld, one of the flight specialists, who worked tirelessly looking for options to get them to the ship on time Saturday. After more than four hours of working on the problem, with phone calls back and forth with Royal Caribbean and my clients, I received a phone call with details for flights departing that evening, which would arrive around midnight. I'd already alerted my guests to head to the airport and told them I'd provide them with the new confirmation information once I got it from ChoiceAir. They were enroute in the limo when I called them. Their original schedule was a non-stop flight, but the only possible choices now, with more than 800 flights cancelled, were connecting flights through Atlanta, GA. Another bonus - they were upgraded to first class. The second thing they had done towards peace of mind was to purchase Travel Insurance with their booking. In the event they would not have been able to get to the ship on time, they would have been able to file a claim for appropriate benefits. And lastly, since they put their travel plans in my hands, they weren't the ones on the phone for hours Friday, trying to figure out how to get to New York. I monitored the flights that evening and saw that they actually arrived in New York around 12:30 AM Saturday. 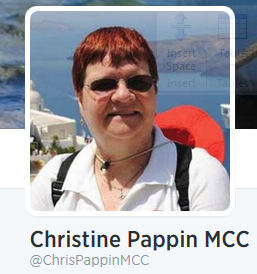 They emailed a picture of the two of them with big grins onboard Quantum of the Seas. I could finally breathe a sigh of relief because I knew how much they had been dreaming about this cruise and how devastating it would have been to miss the cruise. 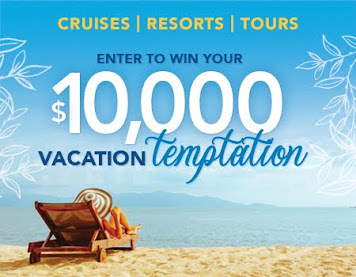 Thank you to Royal Caribbean for actually delivering on your promise when creating the ChoiceAir program. 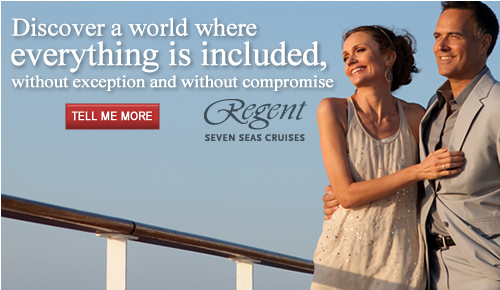 Together with Royal Caribbean, I've been able to make this dream vacation come true. 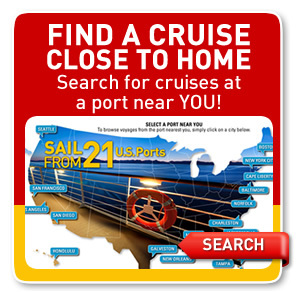 If you'd like to plan YOUR next cruise, I'd be happy to assist you. 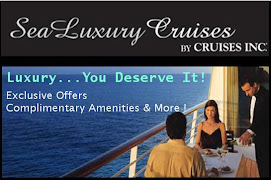 We have several exclusive offers and Royal Caribbean has a WOW sale currently. Check out current offers here. 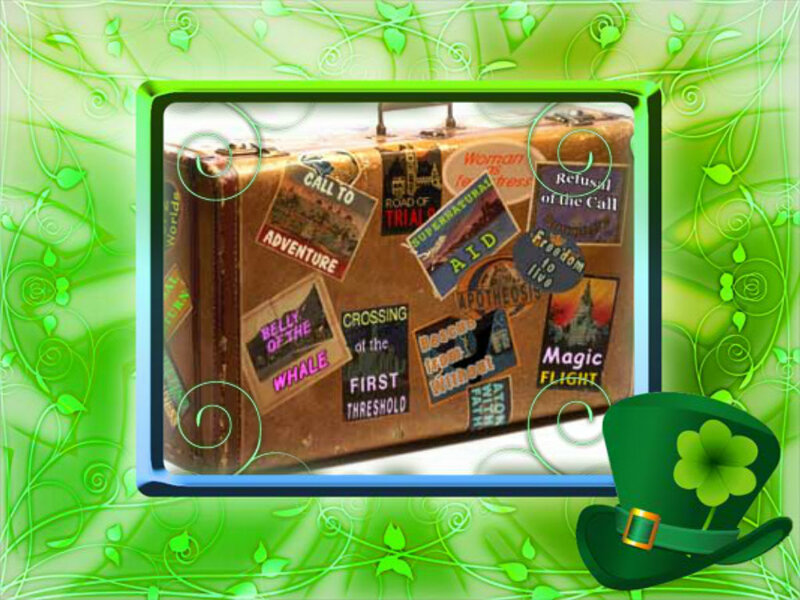 Here in the United States, St. Patrick's Day has become a celebration for not only the Irish, but for all. There are parades and celebrations which include green beer. The Chicago River is dyed green each year in honor of the event. Royal Caribbean has begun announcing their ship deployments for 2016-2017. 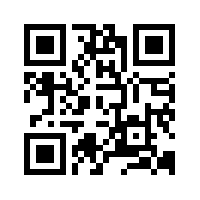 We will provide you the inside scoop here so be sure to visit often for updates. Anthem of the Seas is almost here - she recently went through her conveyance and it was a success! Want to learn more about the conveyance process? Check out this video to learn more and let me know what you think. Pretty neat, right? The building of the Anthem of the Seas, the sister vessel of the Quantum of the Seas, commenced with the keel laying on 19th November 2013. Work will be completed upon delivery of the ship this Spring. As far as entertainment, engineering and safety are concerned, the Anthem of the Seas will be of an equal standard as its sister vessel, the Quantum of the Seas. Once it has commenced service, the Anthem of the Seas will sail with its 4,100 passengers from Southampton (England) to Norway and the Mediterranean, before making its way from Fort Lauderdale (Florida) to the Caribbean in winter 2015. A third quantum-class ship has been ordered from the shipyard and is scheduled for delivery in 2016. Those words from this gripping image in the Irish Mirror sum things up for us the best. Three hours after the first plane struck the World Trade Center, we would see an immediate difference. As with all historic events, one remembers where they were when they heard the news. Our vantage point for the tragic events of 9/11 was Paris, France. 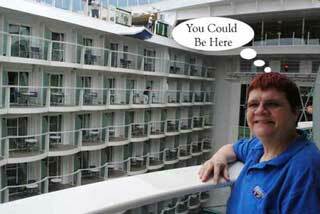 We had just departed on a Transatlantic Cruise onboard the Norwegian Sun. It was it's maiden voyage which left from Southampton, England the day before. We had spent a wonderful day in Paris, about three hours from where our ship docked in LeHarve, France. We toured the city, had lunch onboard a river boat, and did some shopping before returning to our bus for the return to the ship. The bus driver, who spoke only French, tried to tell us about the events by motioning with his hands (showing a plane crashing). Of course, we had no idea what he was trying to tell us. Someone got him to change the radio station and finally a reporter speaking in English broke the news to us. On September 13th, we arrived in our first port of call following the attacks. Arriving early in Cobh, Ireland, we departed for our scheduled shore tour. Our tour guide began the introductions by expressing condolences about the attacks. At the conclusion of our tour, we had some time for shopping near the ship. 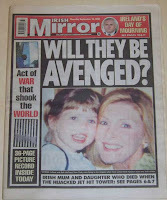 We purchased the Irish Mirror newspaper where we learned of an entirely different perspective on the attacks. Ruth McCourt, 45, was taking her daughter, Juliana, age 4, on a shopping trip from Boston to Los Angeles. Their flight was one of the hijacked planes that struck the World Trade Center. Meanwhile, Ruth's brother, Ronnie Clifford, an architect, was helping to rescue victims from the earlier attack. He was unaware that above his head his sister and niece were perishing in the flames. Here in Co Cork, the rest of the family was attempting to deal with the news of the tragedy that struck their family. After reading this story in the newspaper, we were aware of how far reaching this tragedy really was. An Irish gentleman approached us as we returned to the ship. He said "You are Americans, aren't you". We replied that we were. His response was, "You'll get those B...ds". 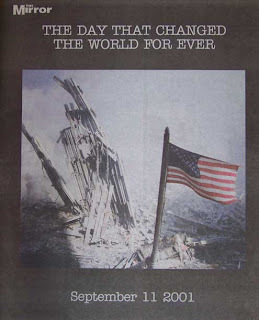 At that moment in time, we were united with the rest of the world, from government officials, to the man on the streets, the world was one in convictions that those responsible had to be held accountable. Ireland Day of Mourning ... Schools, offices, and businesses across Ireland closed on Friday, September 14th for a national day of mourning. 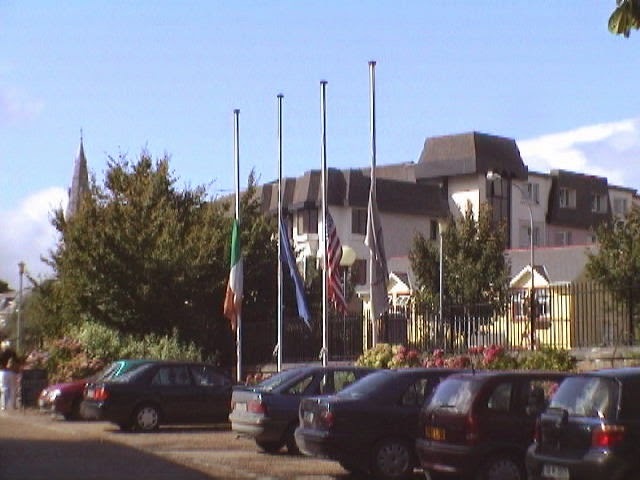 The Irish Mirror reported "Ireland will weep for America tomorrow as the nation remembers the innocent dead". We arrived in Greenock (Glasgow), Scotland on September 15th, and once again were greeted by sympathetic locals. Inaugural festivities, upon the first visit of Norwegian Sun to Scotland, did take place, but they were low key. 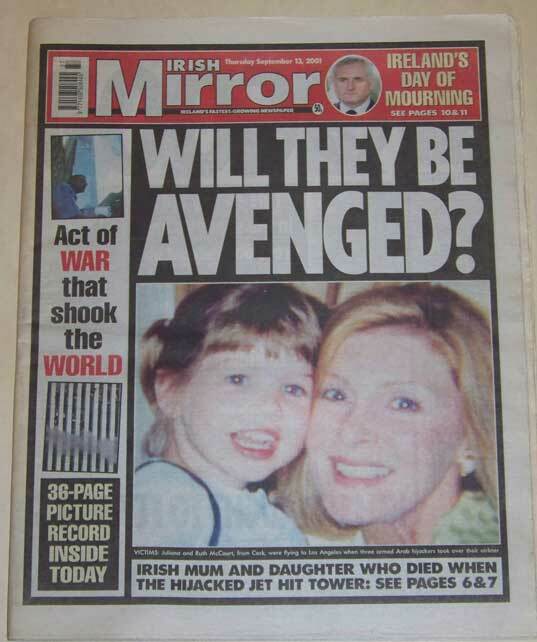 That newspaper headline in The Scottish SUN reflected the sentiments of an American mother and daughter who were amongst the crowd paying respects at Glasgow's George Square as similar mourning events were held across the globe. In London, thousands gathered outside St. Paul's Cathedral for England's memorial. Our day in Scotland was a rainy one, perhaps fitting considering the earlier events of the week. The people were wonderful and we enjoyed our stay despite the tragedy that underscored the entire voyage. Throughout the remaining days of the Path of the Vikings voyage we encountered similar scenes to those in Ireland and Scotland, where flags were at half-mast, the people were caring and sympathetic, and comforted us during this very emotional time. 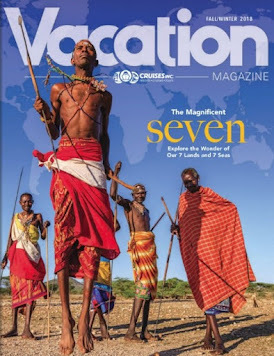 This cruise will always be remembered, not because it was the most exotic or most picturesque, but for the one with the people with the warmest hearts. We will also remember the Captain and Crew of the Norwegian Sun who stepped up to the challenges and helped the passengers through this difficult time. Norwegian Cruise Line definitely went above and beyond when they opened up the phone lines and internet twice during the voyage and rearranged all the transportation for guests since our final destination was changed from New York to Boston. See our Facebook Page for more Pictures from our Path of the Vikings Cruise - Including more 9/11 reflections. While you are there, Like Us so that you can continue to follow our specials and stories. 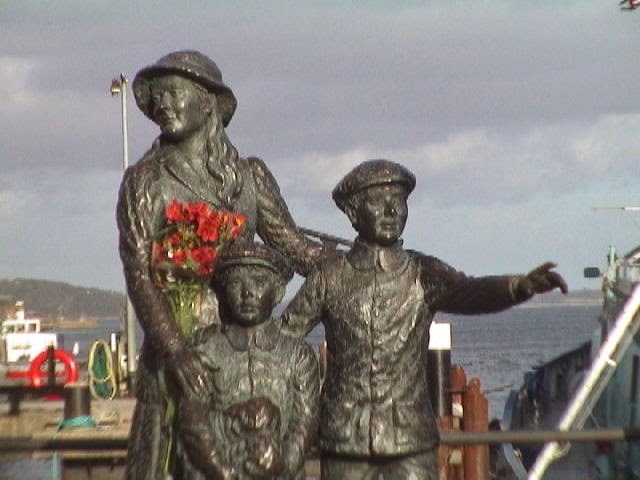 Since #FriFotos is featuring #IRELAND today, we wanted to reflect on how the people there helped us through a tough time. We've cruised to Ireland several times. 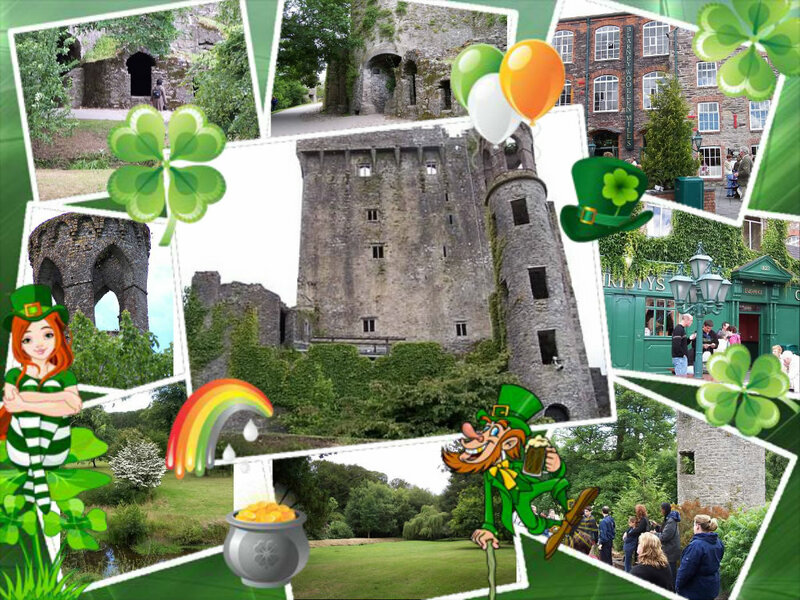 The collage above is made up of several images from a visit to Blarney Castle. This is one of the favorite stops of visitors to the Cobh, Ireland area. 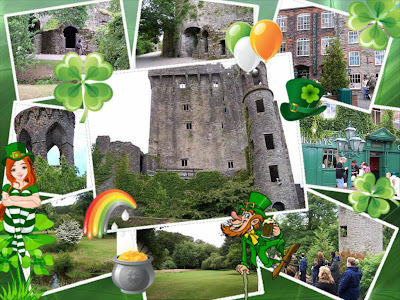 Why not plan a cruise that includes Ireland, and kiss the Blarney stone for good luck? We leave you with this Irish Blessing on this St. Patrick's Day. St. Patrick's Day is next Tuesday and this Friday, #FriFotos is featuring images from #IRELAND all day long. When on a British Isles cruise a few years ago, our itinerary was changed about a month out due to the EU Summit being held in Dublin, Ireland. Our revised itinerary had a stop in Belfast, Northern Ireland. A group of passengers per-arranged a private tour offered by a local tour company. Our first stop was at The Giant's Causeway, pictured above. We arrived at the Visitor's Centre where we learned about the causeway which was formed 60 million years ago from lava. 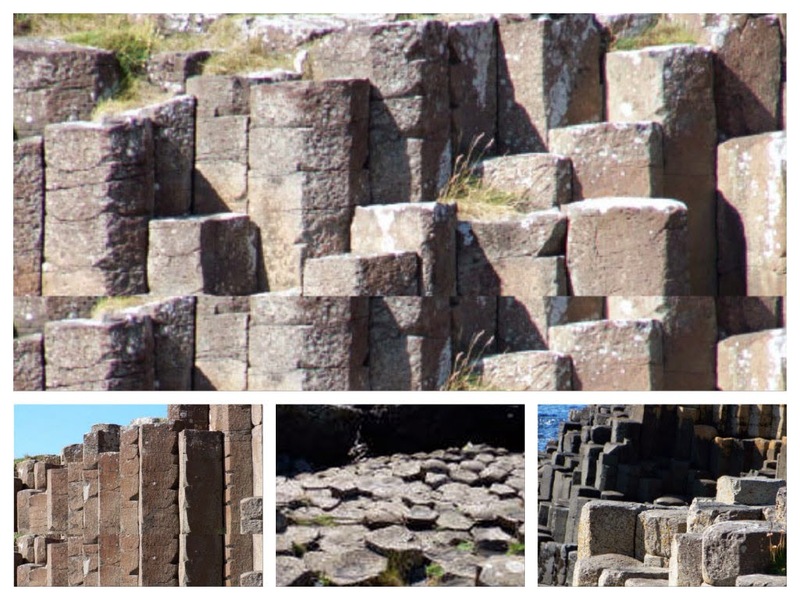 From there we boarded a bus which transferred us to the site of these magnificent basalt columns. The scenery here was breathtaking. 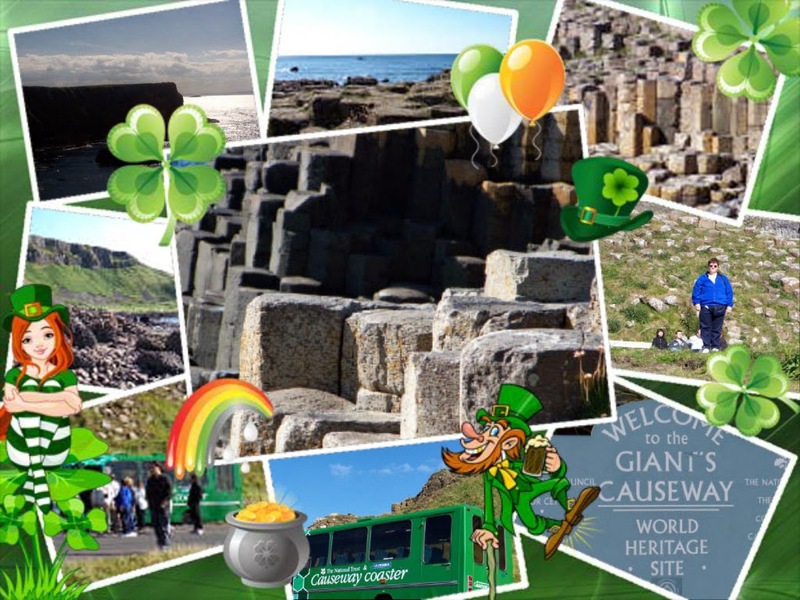 The Giant's Causeway is a Natural Heritage Site and the 8th Wonder of the World. Pictures and words just don't do it justice, but for some more pictures, see my photo album and also click on both of the links above. 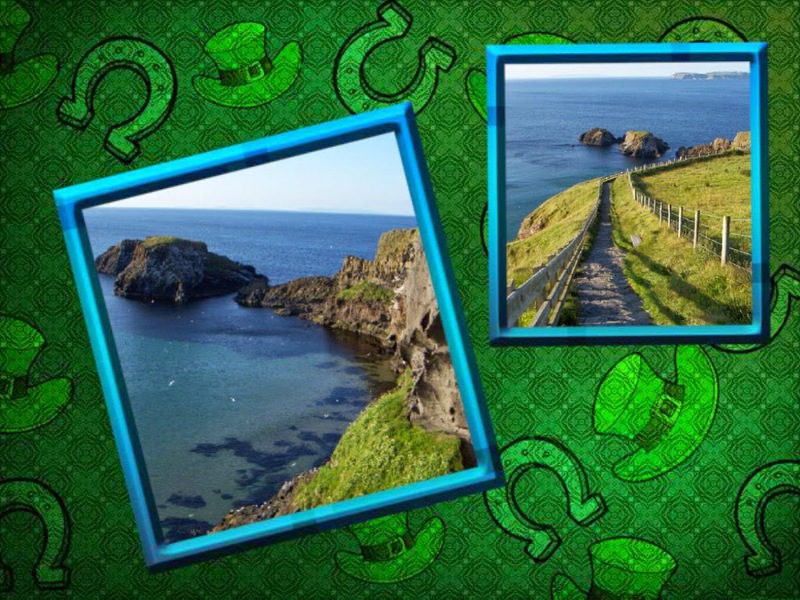 It would be hard to top the scenery which we'd just seen, but we headed for our next stop, Carrick-a-Rede Rope bridge. The bridge was once used by fisherman bringing the salmon catches back from the island but today it is mainly a tourist attraction. The bridge has been enhanced from a single rope to the current caged construction for safety. In order to get to the rope bridge, it is necessary to hike quite a distance along a winding path. Make sure you have good hiking shoes to make the journey as the pathway can be a little challenging as you can see in this picture. I only went part way and my husband did go all the way to the bridge, but not across it. Since we were there after hours, we were not able to actually cross the bridge. 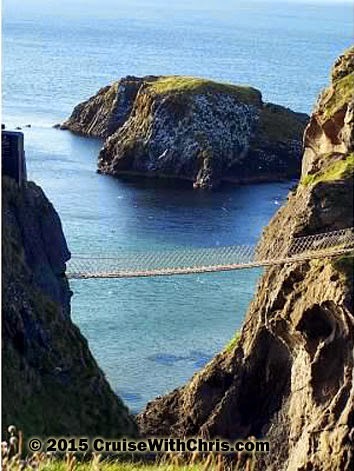 See our Belfast - Rope Bridge photo album for more images from this attraction. Unfortunately, our SD card was damaged and some of the pictures had to be salvaged using a photo-editor which was able to process the .jpeg bits. I guess we'll just have to go back to get better images. Royal Caribbean Harmony of the Seas℠ is the next addition to the Oasis class. Keeping with the tradition of innovation, she will have Royal Caribbean's first water slides at sea. This artist rendering shows the water slides, which will span three decks with exhilarating twists and turns. Harmony of the Seas also will feature a new Bionic Bar on the Royal Promenade. Guests onboard Harmony of the Seas will enjoy RFID technology with Royal WOWBands. Suite guests also will have exclusive new areas to enjoy like Coastal Kitchen and a Suite Sun Zone sun deck. Dynamic Dining will come to Harmony of the Seas. Those preferring a more traditional cruise dining style may select the “Classic”option which will offer two set seating times. Dynamic Dining’s “Classic”option allows guests to rotate through each of the main complimentary restaurants at an early- or a late-seating time throughout their cruise with their dining group and the same assigned waiter each evening. New specialty restaurant concepts including Izumi Hibachi & Sushi, Sabor Modern Mexican restaurant and Wonderland Imaginative Cuisine. 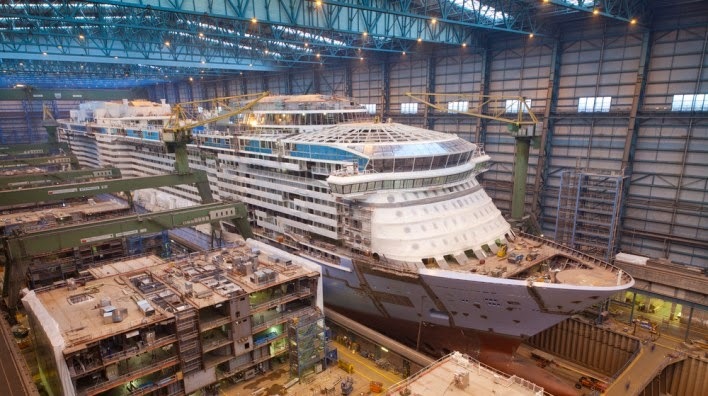 This ship, currently under construction at STX France, will be the third ship in the Oasis class which includes Allure of the Seas the largest ship at sea. It is scheduled to debut in April, 2016. A fourth unnamed ship is scheduled to be completed in 2018.